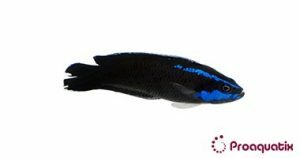 A black-colored Dottyback with two blue stripes running across the head. Pseudochromis springeri is a carnivore of worms and other small invertebrates. Red Sea and Gulf of Aden.